The intense acrimony pervading American civic life today is not unique. In fact, it can be traced to the founding of our republic. Our American story, filled with dramatic conflicts that give rise to hope and fear, assures victory to no leader, party, or faction. We, the people, are the ultimate arbiters of these conflicts and must choose how to go forward. 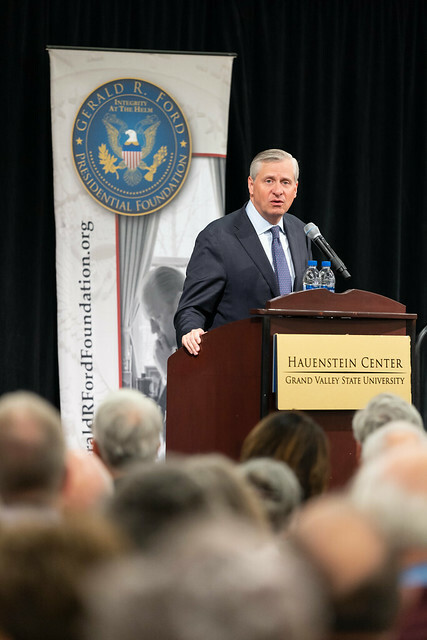 In partnership with the Gerald R. Ford Presidential Foundation and the Gerald R. Ford Presidential Library & Museum, the Hauenstein Center brought renowned historian Jon Meacham back to West Michigan. The bestselling author and Pulitzer Prize winner presented insights from his latest book, The Soul of America: The Better Angels of Our Nature. Jon Meacham is a renowned presidential historian and Pulitzer Prize-winning author. A member of the Council on Foreign Relations and of the Society of American Historians, Meacham is a distinguished visiting professor at Vanderbilt University. He is a contributing writer to The New York Times Book Review, a contributing editor of Time, and has written for The New York Times op-ed page, The Washington Post, Vanity Fair, and Garden & Gun. Meacham is also a regular guest on Morning Joe and other broadcasts. Meacham’s other books include: Destiny and Power: The American Odyssey of George Herbert Walker Bush; American Lion: Andrew Jackson in the White House; Franklin and Winston: An Intimate Portrait of an Epic Friendship; and Thomas Jefferson: The Art of Power.